We highly recommend everyone who uses babylon outside of babel to use this plugin. This will make it much easier for users to switch between different ESTree-compatible parsers. We so far tested several projects with different parsers and exchanged their parser to babylon and in nearly all cases it worked out of the box. Some other estree-compatible parsers include acorn, esprima, espree, flow-parser, etc. If you want to migrate your project from non-ESTree mode to ESTree, have a look at our Readme, where all deviations are mentioned. In flow it is now forbidden to overwrite the primitve types "any", "mixed", "empty", "bool", "boolean", "number", "string", "void" and "null" with your own type declaration. Ensure that you enable the classProperties plugin in order to enable correct parsing of class properties. Prior to this version it was possible to parse them by enabling the flow plugin but this was not intended the behaviour. If you enable the flow plugin you can only define the type of the class properties, but not initialize them. Parsing the following code now returns a FunctionDeclaration AST node instead of FunctionExpression. For more information look at this pull request. When high value unicode entities (e.g. 💩) were used in the input source code they are now correctly encoded in the resulting AST. Will include all parser plugins instead of specifying each one individually. Useful for tools like babel-eslint, jscodeshift, and ast-explorer. Babylon will throw for more reserved words such as enum or await (in strict mode). 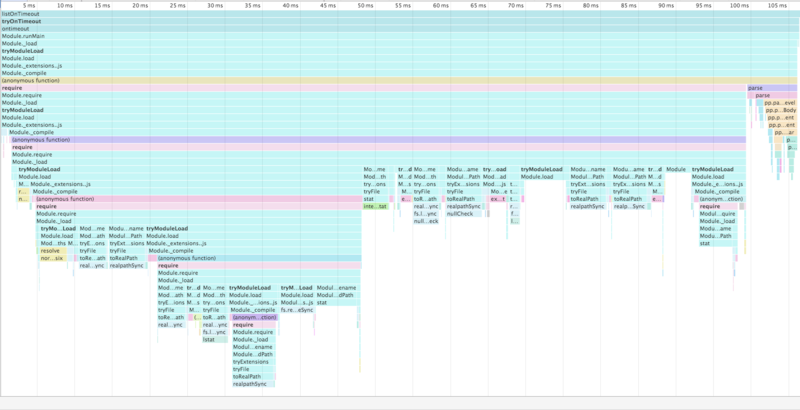 With that test case, there was a ~95ms savings by removing the need for node to build/traverse the dependency graph. Object rest copies the rest of properties from the right hand side obj starting from the left to right. Before, this was just a more verbose way of shallow copying obj since it doesn't actually do what you think. Before y and z would just be the same value anyway so there is no reason to need to have both. The rationale for this is that the use case for trailing comma is that you can add something at the end without affecting the line above. Since a RestProperty always has to be the last property it doesn't make sense. Bail out for now, and make a change to account for destructuring in the next release. We plan to include some spec compliancy bugs in patch versions. An example was the multiple default exports issue. The solution would be to use a top level "use strict" or to remove the destructuring or default parameters when using a function + "use strict" or to. The only change is to remove the babel-runtime dependency by compiling with Babel's ES2015 loose mode. So using babylon standalone should be smaller. This release contains mainly small bugfixes but also updates babylons default mode to es2017. The features for exponentiationOperator, asyncFunctions and trailingFunctionCommas which previously needed to be activated via plugin are now enabled by default and the plugins are now no-ops. Type parameter declarations need 1 or more type parameters. The existential type * is not a valid type parameter. Method Parameter Decorators is now a TC39 stage 0 proposal. There is also a new node type, ForAwaitStatement. Async generators and for-await are now a stage 2 proposal.